There are few grander sights in all of Scotland than the huge squat pyramid which stands guard over the entrance to the Pass of Glencoe. Buachaille Etive Mor is a towering edifice which looks virtually impregnable to mere hillwalkers from the east. But the mountain's defences are breached by a north facing corrie which provides a tiring but exhilarating short climb onto the Buachaille's long whale-backed ridge which extends south west from Stob Dearg to a second Munro, Stob na Broige. Climbers frequently test their mettle on the mountain's great walls, ridges and gullies and car parking off the A82 at Altnafeadh is likely to be at a premium in the summer months. Walk towards the little white Scottish Mountaineering Club hut at Lagangarbh and continue along the track which crosses the River Coupall and heads up into the lower reaches of Coire na Tulaich. The path skirts along to the right of the burn as you gain height and is fairly easy going until the upper reaches of the corrie approach. There is a lot of loose scree and care must be taken not to dislodge any material which could tumble down onto fellow walkers below. A little handwork is also required at the very lip of the corrie in order to haul yourself out on to the ridge. At this point you will see the three other tops stretching out in the distance and if time permits it is a straightforward, but fairly long, ridge walk to take in Stob na Doire (1011m), Stob Coire Altruim (941m) and Stob na Broige (956m). The two middle peaks are not classified as Munros because there is insufficient distance of descent and re-ascent between them, but try telling that to your legs! Climbing to the top of Stob Dearg, which must be one of Scotland's most photographed mountains, is a must and this lies to the left up a steep, rocky path. The path winds its way through the boulders and the ridge begins to narrow quite dramatically as you approach the 1021m summit. 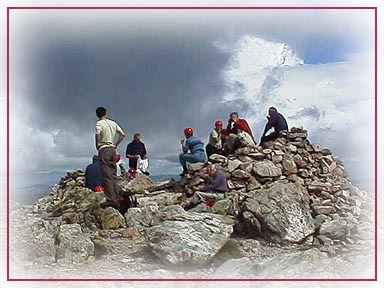 The large summit cairn occupies a seemingly precarious perch but affords wonderful panoramic views over the desolate Rannoch Moor to the east and the shattered Aonach Eagach ridge to the west. On a clear day a keen pair of eyes will also be able to pick out the skiing paraphernalia at White Corries. A group of climbers shared our viewpoint when we visited in September and while they made their own direct route down, we simply retraced our steps back down into the corrie. If you are intending to walk the entire ridge you can bag Stob Dearg first and continue to Stob na Broige before returning to the bealach just past Stob Coire Altruim and climbing down into the Lairig Gartain and making your way out along the valley floor. Distance Entire ridge is 8.5 miles while Stob Dearg alone is only 3 miles. Start/parking Layby off the A82 at Altnafeadh. Grading Fairly direct and therefore steep ascent of a popular hill. The entire ridge walk is long and exposed and the weather in this part of the country is often atrocious. Suitable for fit and well equipped parties who have a head for heights.